Thanks for the +1 and the suggestions! The problem with Endless Scream and Dauthi Mercenary , as much as I love especially the latter, is that both of these cards are really only useful in the late game, and this deck is not designed to ever get that far - you either win between turn 3-5, or the opponent has probably removed enough creatures that it's almost impossible to get back into the game. The deck also doesn't have any way of defending itself, so by that point, they should have done a substantial amount of damage. Some more playtesting might be in order to see if those cards might have value against control, but I feel like going for maximum speed is still my best bet. 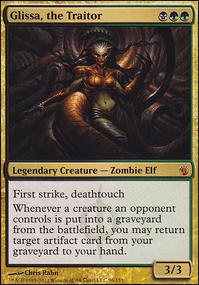 Bonesplitter , again, sacrifices speed for long term viability, but in that case, I feel like it might be worth the cost. Will also require some testing. Same with Infernal Scarring , and I probably wouldn't want to play both. So it's a choice between definitely keeping an equipment after a removal, or potentially drawing a creature, which is often more important... not an easy choice, but I'll keep them all in mind. Will probably go for either Predator's Gambit or Bonesplitter , since I've already bought those. First off, love this deck! You got a +1 from me! 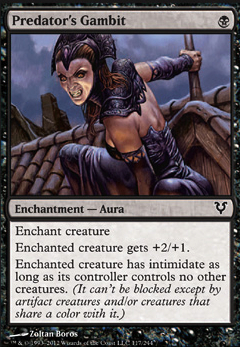 I've always been attracted to Shadow as a mechanic, but I've never gotten around to delving into it too much. 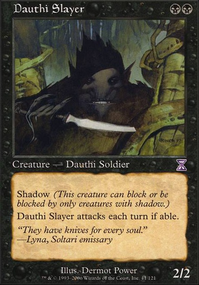 I like Dauthi Mercenary * better than Dauthi Marauder . Both are 3-drops with shadow, but while the Marauder starts out with one more power, the Mercenary has the potential to be pumped up higher, especially if you have a Dark Ritual and nothing else to play with it. It's a good late-game mana sink when you've run out of cards in hand (and considering your curve is so low, I imagine that that's easy to do). * T/O claims that Dauthi Mercenary isn't pauper legal, but Scryfall disagrees, because it's a common on the MTGO-only set Vintage Masters. 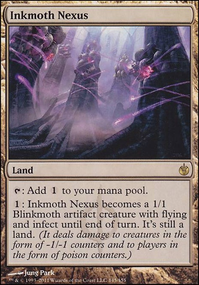 From my understanding, MTGO legality is currently also used for paper pauper. Another card that scales for the late game is Endless Scream . Maybe try a 1-of? I also like Infernal Scarring , probably in place of Predator's Gambit . 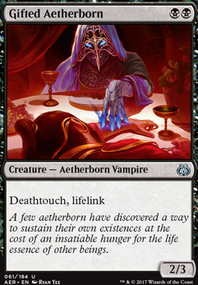 It's 1 more mana, but Gambit's toughness boost and Intimidate are irrelevant, whereas the death-trigger card draw makes the creature a less attractive target for removal, while being a much better target for your own Rite of Consumption . Alternatively, have you considered equipment as well as auras? The only one I'd suggest is Bonesplitter (in place of Predator's Gambit ). Sure, it costs 1 more mana for the very first time, but against a removal- / bounce-heavy deck, it'll be way better in the long run. You won't get 2-for-1-ed then, and subsequent re-equips are just as cheap as Gambit. mal099 on Turn 3 Win Decks? 7 Cards, many of which can be replaced. 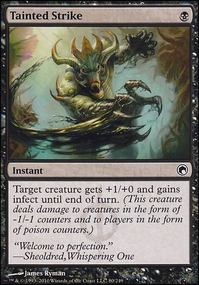 The deck can also win by turn 3 with Rite of Consumption by going for damage instead of infect. Does require some luck, but not too much, Dark Ritual is the main thing you need. Specifically, Edge of Divinity has some alternatives that are strictly better for this deck, like Predator's Gambit . Molting Snakeskin might also be a nice alternative. I also removed Bonesplitter and Dauthi Marauder for being too expensive, but all alternatives for the latter are easier to block. I could see those drops (Spirit Loop and Predator's Gambit), possibly drop Hero of Iroas for Cloud Key while you are at it, because it affects more of your deck, and is harder to remove. Otherwise the combo doesn't need any support, as Chromium, the Mutable is a sure-fire source of life-loss. SynergyBuild, the decklist is now in the description. I’m not quite sure what I’d cut to include the combo. What are your thoughts on cuts? I’m probably leaning towards removing Predator's Gambit and Spirit Loop. I love the 8 card combo! No one will ever see that coming. lol. MalcolmTent, bouncing Necropotence before discard, isn’t a bad idea at all. Also, protects it from removal, if need be. I’ll definitely keep that in mind. Thank you! Thank you, SynergyBuild and skoobysnackz. Tunman, like SynergyBuild stated. I also, didn’t find Vanishing too beneficial in this case. It is an option for protection, if extra is needed for certain metas. Right now, for me, the flex Auras that can be swapped out for alternate spells are, Predator's Gambit, Indestructibility and Spirit Loop. So if this were to be used as a blueprint. Those spells are good as gone for other flavor spells. jesusaintnodj, thanks for the +1! I’m glad you enjoy the build! SynergyBuild, did mention before that I should add an infinite combo. So by popular demand, I’ll do just that. I’ll add Exquisite Blood + Sanguine Bond . Also, I have been playing around with a couple prototype builds based on this. One that is the “Control Edition” and the other I have dubbed the “Time Walk Edition.” Time Walk Edition, includes Nexus of Fate, Time Warp, Temporal Mastery, Temporal Trespass, Karn's Temporal Sundering, Temporal Manipulation, Capture of Jingzhou and Walk the Aeons. Cards that I cut for those are, Predator's Gambit, Indestructibility, Spirit Loop, Gilded Lotus, Consecrated Sphinx, Hero of Iroas, Kor Spiritdancer and Sram, Senior Edificer. Why don't you play Vanishing instead of Predator's Gambit or Indestructibility?